The Oley community of home nutrition support consumers and caregivers is filled with not only challenges, but also many ingenious solutions. Cottage industries evolve as consumers, families, and clinicians identify needs associated with chronic health conditions and home enteral and/or parenteral nutrition (HPEN). Five of our many “inventors” brought their products to market and displayed them at the 2017 Oley conference in Greenwich, Connecticut. We share highlights of their stories here. Please see the more in-depth coverage of the interviews at the end of the article. Kezia and Mike Fitzgerald’s eleven-month-old child was diagnosed with cancer. Tangled infusion lines were always a threat, so Kezia went to work and developed her first cover for a PICC line (peripherally inserted central catheter), called the CareAline PICC Line Sleeve. It contains a pocket to safely store the exposed PICC line tubing, reducing the risk that a line may be accidentally pulled out, necessitating replacement. 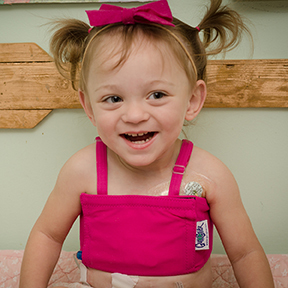 When her child’s PICC line was replaced with a central venous catheter (CVC), Kezia created the CVC Protection Wrap. Patients, doctors, and nurses in the field saw these products and began requesting them for use on others at the hospital. Suddenly Kezia recognized a business opportunity that would also allow her to stay true to her wish to help others—and CareAline was born. Kezia was thrilled to help a family with a preschool child. Whenever the child’s line got pulled out, the family had to make a two-hour, middle-of-the-night trip to the hospital. Kezia says the PICC cover saved the family from future accidents of this type and relieved the stress of emergency trips. CareAline sells directly to hospitals for their patients’ use, online, by word of mouth, and through referrals from other patients. Kezia noted that they plan to expand to create products for geriatric and adult patients. CareAline was incorporated in 2012 and now has thirty hospitals using their products, including some in the U.K. In order to continue to do good deeds, they offer an online link for people to donate a product to someone in need. Mike and Kezia are artists by trade. Kezia is a photographer; her husband is a painter. In addition to growing their company they have a healthy four-year-old son. When Emily Levy contracted Lyme disease, she had to deal with a PICC line and accessories for her IV treatments. She couldn’t find a product she considered stylish and practical to cover the line so she developed the PICC Perfect line cover. As an active person, Emily looked to sportswear and technology for inspiration. Emily is also planning several new products: the “Mighty-Pack” for meds (like parenteral nutrition) that need to be kept cool, which will be modeled after the “GoPro”™ case; and antimicrobial, wicking shirts with port and feeding-tube access. Emily thinks of her venture as a for-profit with social impact. Mighty Well is supported in part by investment from a former VP of marketing for Reebok, who sees the potential. She sells her current products on the Mighty-Well website, Amazon, directly to children’s hospitals, cancer centers in Rhode Island, and a few overseas sites. She employs two full-time and three part-time employees and a contract design team. She also sells T-shirts and hats with inspirational quotes. Emily is rewarded by those she can help. She gave a prototype PICC cover sleeve to a child with leukemia, who can now run around the playground like other kids. Emily also speaks at conferences and trade shows, from a patient’s perspective. She went to work, eventually creating Tubesies, a tube-feeding-friendly bodysuit. The shirt provides access through a window directly over the feeding tube, with a waterproof pocket that holds 2" x 2" gauze to absorb any leaks. The access windows are integrated into the shirt designs so they are fun for those children who can assist with their feedings. She is inspired by the kids’ success, happy to ease the stress of parents and caregivers, by saving time. Gus Gear’s founder, Sarah Palya, needed solutions for her son, who has a central line, a G-J tube, and an ostomy. Worried he would pull his line out, she created a central line wrap to sec ure it and prevent line breaks. Gus Gear also makes products for securing G-tubes, as well as covers for lines, pumps, and ostomy pouches for children and adults. Sarah also feels good about helping other concerned parents. A parent shared with her the time their five-year-old child ran away from his parenteral nutrition bag with the line attached. Sarah’s wrap helped keep his central line from dislodging. Her device won the N.E. Pediatric Device Consortium Target Challenge in 2017, for preventing line dislodgement. Gus Gear’s products are sold at nursing and medical professional conferences, in hospitals, and on the Internet. Its customers include US and Canadian hospitals. The company is seeking a path for insurance reimbursement so its products will be available to those who cannot afford to purchase them themselves. Tube-feeding consumer Tom Dawson lost the ability to eat when radiation to treat throat cancer damaged his esophagus. He was frustrated with the awkwardness of socializing when it was time to “eat.” Being a positive person, he got to work finding a solution. Tom said he was rewarded both by his own enhanced quality of life, and by a woman at his church who said his shirt changed her life. She had confined herself to her home for feedings and had newfound freedom when she could feed unobtrusively in public. He participates in trade shows/conferences, sells online, and is hoping to partner with hospitals and companies that sell tube-feeding supplies. The shirts are made in the San Francisco area, where Tom resides with his wife. Editor’s Note: You can find information about other products of value to the HPEN community, as well as creative solutions to problems, at www.oley.org/BrightIdeas_Landing. Kezia developed her first PICC cover in 2011 for her then 11-month-old child who was diagnosed with cancer. Around the same time, she herself was diagnosed with cancer. Her motivation to create a solution for tangled infusion lines drove her to develop the CareAline PICC Line Sleeve and the CVC Protection Wrap. The sleeve has a pocket to store the exposed tubing from the PICC line. Once she solved that problem, the PICC line was removed and her child got a central line. Now that she needed another product to protect this type of line, she developed the wrap. When other patients, doctors and nurses saw these products in the field, they began requesting wraps and PICC covers for use on others at the hospital. Suddenly she saw a business opportunity, but her motivation was still driven by a wish to help others. She finds it rewarding to have the opportunity to protect infusion lines. The products reduce the need for replacement of lines that are accidentally pulled out by children. Kezia recounted the time she met a Los Angeles family who had a preschool child with a line. They had multiple episodes of packing up the family in the middle of the night to make a two-hour trip to the hospital when the line got pulled out. They found the CareAline products online. It saved them from future “accidents” and relieved the stresses of emergency trips. Seventy percent of CareAline’s sales are to hospitals for their patients. Others are online, by word of mouth and referrals from other patients. They are currently ramping up their marketing efforts and working with predominantly pediatric infusion suites but expanding to geriatrics and adults. CareAline was incorporated in 2012 and now has thirty hospitals using their products, including some in the UK. There is a provision on their website for people to donate a product to someone in need. Emily contracted Lyme disease and had to deal with a PICC line and accessories for her IV treatments. She wanted a product to cover the line and found nothing to her satisfaction— so she developed the PICC Perfect line cover. Being an active person, Emily looked to sportswear and technology for inspiration. She found an anti-microbial, wicking material in a variety of patterns, and offers the covers on her website, along with T-shirts and hats with inspirational quotes. —The “Mighty-Pack” for meds (like HPN) that need to be kept cool, with room for medical accessories like Epi-pens, diabetic supplies, tubing, batteries, inhalers, etc. It will be modeled after the “GoPro”TM case. —Antimicrobial, wicking shirts with port and feeding tube access. Emily’s target market is those with an active mindset who want to live life to its fullest, but also want style, comfort, and practicality. She thinks of her venture as a for-profit with social impact. Mighty Well is supported in part by investment from a former VP of marketing for Reebok, who sees the potential in her products. She is selling her current product on the Mighty Well website, on Amazon, directly to Boston Children’s and Cook’s Children’s Hospitals, the gift shop at Dana Farber, all cancer centers in Rhode Island, a doctor in Hong Kong, and a pharmacy in the Netherlands. She does all this with two full-time and three part-time employees and a contract design team. Emily is sustained by the many stories of those her product has helped. She gave a prototype PICC cover sleeve to a child with leukemia. Her mother is grateful that it allows her child to just be a kid and run around a playground—things most take for granted, but a gift to those with medical needs. Emily also finds time to speak from the patient perspective at trade shows and conferences while promoting her products. Tubesies, a manufacturer of a tube-feeding-friendly bodysuit, was invented by seventeen-year pediatric nurse Cecilia Auth. She worked in the newborn ICU, then a pediatric GI department with a feeding therapy program for children, some using tube feeding. “As a nurse, we were challenged by obstructed access to [feeding tube] ports. We had to wake and undress the children at feeding time. They were unhappy and crying, making it difficult to feed them.” So from her perspective, being able to feed the children without disturbing them enhanced their ability to feed. The shirt has an access window directly over the feeding port, with a waterproof pocket that holds 2” x 2” gauze to absorb any leaks from the port. It took her twelve months to patent the device. The access windows are cleverly integrated into the shirt designs to be pleasing to the eye and fun for those children who can assist with their feedings. Seeing the kids’ success inspires her and she’s happy to ease the stress of parents and caregivers, save time, and normalize the feeding process. Cecilia shared this story: The parent of a three-year-old child from New Hampshire with a G-J tube reached out to her, anxious to get the product while it was in development. Cecilia gave her a prototype for feedback. When the mom sent her a picture of the child in a stroller, they became forever entwined in each other’s lives. Gus Gear makes products for securing central lines and G-tubes, and covers for lines, pumps and ostomy pouches for children and adults. The products were invented by founder Sarah Palya for her son, who has a central line, G-J tube and an ostomy. Always worried he would pull his line out, she wanted a way to secure it and possibly prevent line breaks, so she created the central line wrap. The company’s focus is safety and quality of life. Her device won the N.E. Pediatric Device Consortium Target Challenge in 2017, for preventing line dislodgement. Gus Gear’s products are shown and purchased at nursing and other medical professional conferences, hospitals, and on the Internet. Their customers include US and Canadian hospitals that purchase the central line wraps for their patients. The company is seeking a DME reimbursement code so insurance will pay for the central line wrap. The Tubenmann shirt was invented by tube feeding consumer Tom Dawson when he grew frustrated with the awkwardness of socializing when it was time to “eat.” Tom lost the ability to eat when radiation due to throat cancer damaged his esophagus. Being a positive person, he got to work finding a solution. He asked a local seamstress to fabricate a zippered “pocket” in a shirt so he could discretely access his feeding port. And so the Tubenmann shirt was invented. The logo originated from a stick drawing Tom made of a happy man, holding a tube. The name is German for “The Tube Guy,” a nod to his annual teaching job in Germany. Tom, an attorney by trade, said the hardest part of this endeavor is marketing. According to Tom, there are “between five hundred thousand and one million people in the US” who use tube feeding, due to some three hundred different conditions. He participates in trade shows/conferences and has an online store. He has approached suppliers of tube feeding services and hospitals. He said it is impossible to get into these companies and is hoping to partner with companies who have access to the customers in his market. Tom said he was rewarded both by his own enhanced quality of life, and by a woman at his church who said his shirt changed her life. She had been confined to her home for feedings and found she could participate fully in life when able to feed unobtrusively in public. Tom said, “I will know I’ve reached the pinnacle when I see someone across the coffee shop or at a concert hall, discretely feeding through their Tubenmann shirt.” The shirts are made in the San Francisco area, where Tom resides with his wife.